You can download the version 1.0 of the plugin here. 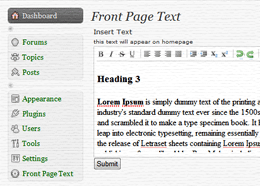 As you may know, the current version of BBpress does not include the WordPress nice functions of formatting text but this release also includes a WYSIWYG editor so you can format the text using headings, paragraphs, etc. Unzip the the file and add within your bb-plugins folder than go in the bb-admin control panel and activate the plugin. The Front Page Text tab should appear after the Settings tab. Go inside and add the desired text. The plug-in is built in mind for home page, but you can add the tag anywhere in your template files, for example the registration page. The plug-in has been tested with the BBpress 0.9 and 1.02 versions and it is built to work with further BBpress releases, unless some radical modifications are added on the way. The plug-in is free to use and modify. Enjoy! I’m running 1.0.3. Anyway to update the script? This plugin is not supported any longer. I would try finding help at wpquestions.com paid forum.